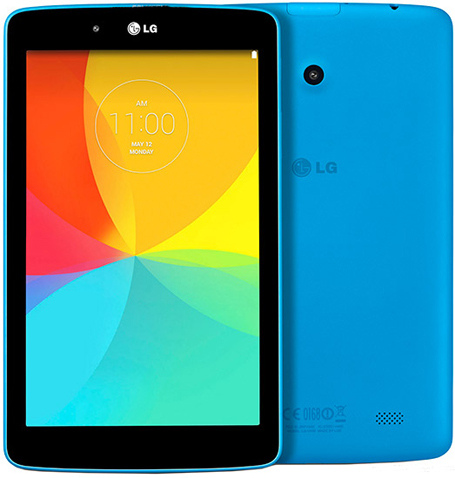 LG G Pad 7 was launched in 2014 and it belongs to mid segment range because of its price tag. But still it carries good hardware and features. Display of LG G Pad 7.0 is made of IPS technology and has a diagonal of 7.0’’ at a resolution of 1280 × 800 (out of 216 pixels per inch). Picture quality and WXGA resolution is enough for this size screen. Read, Surf and watch a movie and here is no problem, even for long journeys eyes do not get tired. The viewing angles of the display are acceptable only under severe deviation picture begins to lose intensity. Color reproduction is not perfect, the image is slightly out in warm colors, but within reason. Margin of brightness in the tablet is not very big, and the there is no sensor for automatic brightness adjustment, but the company went out of elegantly this situation programmatically adding the ability to reduce the brightness to zero during the period from 00:00 to 06:00. Display a bang collects fingerprints, which are clearly visible and not so easily removed. In fairness it should be noted that even screen finger glides easily. In general, the screen in the LG G Pad 7.0 is not without nuance, but the picture is pleasing to the eye, and this is important. Inside the tablet works “forever young” quad-core processor Qualcomm MSM8226 Snapdragon 400 with a frequency of 1.2 GHz, the graphics accelerator Adreno 305, RAM 1 GB. “One unfortunate” gigabyte is enough for simple tasks and programs, but in a variety of heavy games will have to make a choice, or by switching from Real Racing 3, Chrome, and then back again. As for performance in these most difficult games, everything is in order – Real Racing 3 is not smooth but works without slowdown, Dead Trigger 2 is initially running at medium graphics settings, but even at high specific problems arise, the most that can happen, because it lost a few frames in dynamic scenes, not more. The only thing you would not like, so it’s background objects are not always clearly outlines and acquire the staircase effect – this can be attributed to the low resolution of the screen. By the way, in about the heat – intense games make the tablet seriously heat up in the upper left corner, after a while it may even cause discomfort. The overall operation of the system at a high level – it is not always 60 frames per second, but the tablet is definitely smart and “thinks” is extremely rare. One not very pleasant moment is that when the application closes the tablet does not always have time draws a desk and a fraction of a second is necessary to get a black image instead of the one you have installed. Well, overall performance is nice and you can’t expect something blazing fast from the mid range device from LG. But LG is moving towards the crown of the biggest manufacturer of smart devices and we might see the competing device of LG to the upcoming range of Apple iOS 9 devices.